Let’s face it. For most of us, there aren’t enough hours in the day. We’ve all been told, or told someone else, that we need to schedule in exercise just like we do everything else. I agree. I’d also agree that we all find time for what’s important right? But in the end, when the to-do list is overwhelming – and it is most days – something has to give and too often it’s exercise. I’ll admit that my exercise goals for 2014 didn’t exactly pan out like I wanted to. And being in the health and wellness business, I know just exactly how important it is. So for 2015, I’ve made some changes. Change #1: I’ve re-worked my private practice schedule and I will have fewer patients and fewer office hours. That means live on less money – just like it does for the rest of the world – but if I have to spend all that extra money trying to get my health back, it’s not worth it is it? I am creating time in my life for exercise as well as work/life balance. Change #2: I’ve started doing High Intensity Interval Training (HIIT). It means a much shorter worked but the great news is that it’s even MORE effective than my 45-55 minute cardio workout from last year!!! I can and will find 20 minutes 3 days a week to do an intense cardio workout! High Intensity Interval Training (HIIT) is a specific type of interval training routine. Its short bursts of INTENSE exercise (like sprinting) with REST intervals in between. A routine usually lasts 20 minutes or less and that includes the warm up time! When done correctly, 20 minutes is ALL you got! I know. You’re thinking…”how can 20 minutes possibly be a “good” workout” but hang with me and I”ll explain. The goal is to create oxygen debt (anaerobic conditions) during the session, and then your body is still busy for hours and hours afterward trying to catch up. It means you’re still working out later that day. It can be done with any exercise (lifting weights, riding a bike, an elliptical) but some say the optimal form is sprints. And you can sprint on a treadmill or outside if the weather is amenable. If you have injuries, another good option is a stationary spinning bike. Time. Simply put, it’s a GREAT workout in a fraction of the time. Since time is one of the biggest barriers to a consistent exercise routine, even time-crunched individuals can fit this into their schedules. Who can’t find 20 minutes 3x/week to do this??? 12 weeks of HIIT not only can result in significant reductions in total abdominal, trunk, and visceral fat, but also can give you significant increases in fat-free mass and aerobic power. Generally healthy middle-aged adults were able to improve their insulin sensitivity and blood sugar regulation after just TWO weeks of interval training. Other studies support HIIT’s effect on blood sugar as well. Builds testosterone – which we all need on some level. Testosterone helps us ladies with muscle growth. Folks this is HUGE. 20 minutes x 3 sessions a week. A sensible diet. And a 20 minute core strength training on the off days and you are well on your way to a healthy and fit body. In a fraction of the time. It sounds too good to be true but there is a lot of good solid research on this! Eat a small, quickly digested meal prior to your session. Exercise as hard and fast as you can for 30 seconds (7 to 10 MPH depending on your current fitness level). You should be gasping for breath and feel like you couldn’t possibly go on another few seconds. If you have a heart rate monitor, you want to be an an anaerobic zone. Rest for 90 seconds. Like 2-3 MPH on a treadmill for example. Keep moving but a slow pace. Cool down for a few minutes afterward by cutting down your intensity by 50-80 percent. An HIIT workout should NOT be done on consecutive days. The goal is to operate at a HIGH intensity. Let’s face it. You can’t give it 110% every single day and that is what we’re talking about. A good HIIT workout burns energy from your muscle systems and it needs time to replenish it. If this doesn’t happen, you will not be able to workout with as much intensity and you have a much greater chance of injuring yourself. The benefits actually happen in your body during your rest period and the more rested you are, the more intensity you can put into your workout. Recent research indicates that it’s better to have had something to eat about half an hour before you exercise to fuel your workout. Make sure it something balanced and easily digestible, you don’t want something heavy while you are exercising. I consume 1 tsp E-lyte (electrolyte replacement WITHOUT sugar) and 2 tsp of Branched Chain Amino Acids in 16 oz of water prior to my HIIT routine. And another dose of the same immediately after. Be sure not to consume any sugar within 2 hours after your workout or you’ll increase somatostatin which will destroy your ability to make that growth hormone! You also want to have a sensible lower-carb diet in general so that you don’t give insulin an open door. Eating carbs stimulates the production of insulin. Insulin is a storage hormone and helps us make fat. So choose low glycemix carbs like blueberries, blackberries, and maybe quinoa if you eat grains. Be mindful of your current fitness level. You might not be able to complete all 8 rounds the first time out of the gate. That’s okay. Work into it and be smart about not overdoing it or injuring yourself. 2 minutes warm up. 20 seconds max/10 seconds rest. Repeat 8 cycles. This workout is only 6 minutes in its entirety! Best for those already quite fit. After about 6-8 weeks on a single HIIT plan, change it up. Your body has adapted to your routine and you’ll get more benefit by doing a HIIT bike routine, a HIIT weight lifting routine, or something different from what you have been doing. To a fit and fabulous 2015 and beyond! 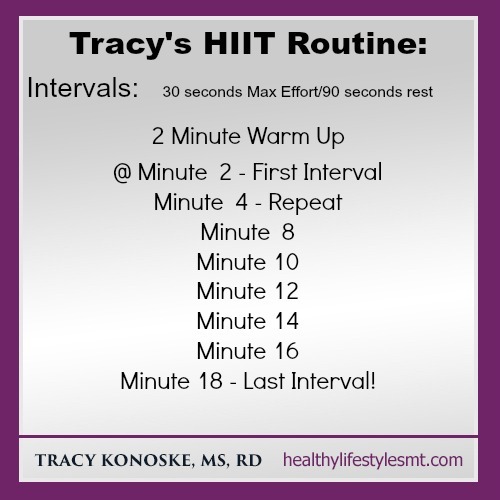 Thanks to Dr. Jill Carnahan for the heads up in HIIT!